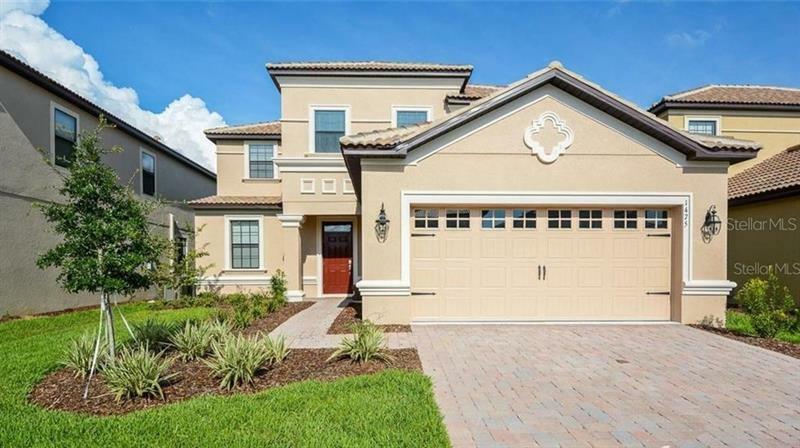 This FULLY FURNISHED 2 Story Mediterranean POOL & HEATED SPA home located in the Exclusive and Sought after Short term section of StoneyBrook South of Champions Gate! Professionally Furnished & Decorated from stores such as RESTORATION HARDWARE, CRATE & BARREL, LAND AND NOD!The DUAL MASTER HOME provides the first Master Bedroom located on the LOWER level of the home & second Master Suite in UPPER portion of the home.One is immediately greeted by the OPEN DESIGN of the Foyer flowing into the kitchen and formal dining area with finishes that include large Ceramic Tile flooring. The kitchen boasts upgraded finishes such as Stainless Steele GE Glass Range, Built in Microwave, Side by side Refrigerator w/water dispenser and Dishwasher.Completing the look of the kitchen is Granite Counter Tops, Goose neck Faucet, Stainless steel under mount sink, warm inspired color Cabinetry w/brushed chrome knobs & pulls, Hanging sconce lighting over the bar area & much more.The large family room leads into the Screened in Pool & Heated Spa area overlooking a beautiful green space with a Private community Brick fence allowing for more privacy!The upstairs portion of the home centers around the large shared LOFT area creating the perfect additional Living space for family & friends to enjoy with guest bathrooms that include granite counter tops, brushed chrome faucets, & upgraded Shower wall tile.Completing the home is the 2 Car Garage which has been converted into a GAME ROOM with foosball & pool table. Come relax in your new home!